Wild Coast Sun has become the first hotel in Africa to achieve a net zero waste rating from the Green Building Council of South Africa (GBCSA). The hotel is owned by Sun International and is situated on the border between the Eastern Cape and KwaZulu-Natal. The rating was given to Wild Coast Sun for an ambitious recycling project. The hotel has achieved zero-waste-to-landfill since the end of 2016. A strict operational and waste management plan was implemented at the hotel and regular audits were submitted to the GBCSA. Wild Coast Sun also held educational talks and seminars to raise awareness of zero-waste-to-landfill among staff members. The hotel has effectively recycled 1 200 tonnes of waste since the start of the project. This not only creates jobs for the surrounding community, but it has also helped to minimise waste in the Wild Coast environment. The recycling project now sustains two permanent enterprise development projects in the area. The hotel has a large compost yard on-site that produced over 180-tonnes of compost during 2018. This compost was used to fertilise the hotel’s grounds, vegetable garden and golf course, saving R440 000 on the cost for fertiliser. All of the organic waste from the hotel’s kitchen was sent to the compost yard. Excess vegetables from the garden are donated to local schools. Wild Coast Sun sent all of its plastic waste to be recycled. Non-recyclable waste, such as furniture, electronics and linen, were donated to the local community and non-governmental organisations (NGOs) nearby. Other non-recyclable waste items were used to manufacture eco-bricks in Port Edward. The safety, health and environmental officer at Sun International, Sonja Stroud, says that the company’s approach to sustainability is based on the need to protect the environment and save natural resources. “Eliminating the waste we send to landfill is a natural progression of this strategy. To achieve our zero waste goal we had to scrutinise every element of our operation at the Wild Coast,” says Stroud. “The first step was to get rid of skips and compactors and to sort the waste on-site. Now, recycling and repurposing waste lessens our environmental footprint and also assists people living in the communities we do business in through donations of physical products, excess food from our gardens and the creation of new business and employment opportunities,” she explains. The GBCSA completed its audit of Wild Coast Sun at the end of 2017, after which an external audit was done by professional environmental consultants, GCX, in 2018. 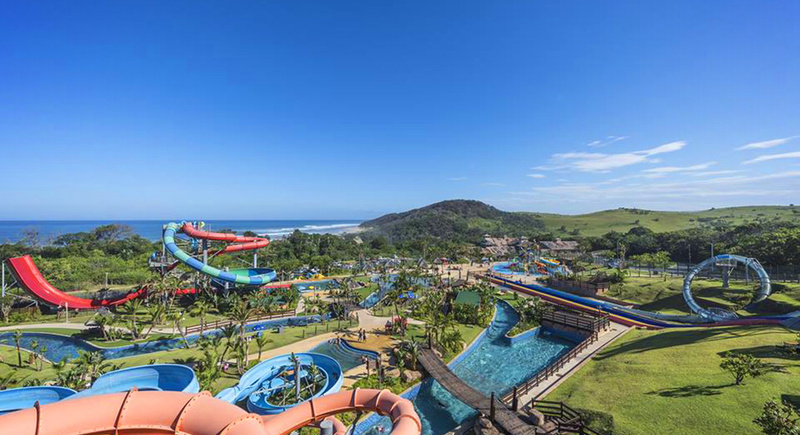 Wild Coast Sun strives to be a leader of waste management in the hospitality industry by encouraging its suppliers and partners to introduce similar zero-waste-to-landfill initiatives.